A tornado was reported yesterday afternoon from Branxton. Two thunderstorms, one developing west of Cessnock and the other around the Mt Royal ranges near Singleton, merged around Broke at about 4pm and then travelled towards the northeast. The storm itself was a supercell and produced 2 - 3 cm hailstones in the Singleton area (including Branxton). The back end of the storm showed large amounts of rotation and had an inflow band that stretched approximately 30 km. 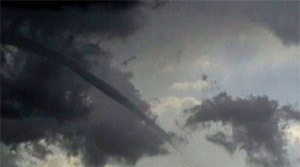 The tornado was reported to the Bureau of Meteorology at about 5pm by storm chasers James Harris and Andrew McDonald. Fortunately, the tornado was only weak and occurred away from any major urban areas, so therefore no major damage was reported. The thunderstorm produced awesome and eerie cloud formations that made the sky very colourful. A blanket of mammatus (clouds that hang down from an anvil of a thunderstorm in a bubbly formation) covered a large part of the Hunter. Mammatus of this magnitude is very rare, but are commonly associated with supercell thunderstorms.